Our Chicago breach of contract attorneys have experience in handling a broad range of breach of contract claims and lawsuits. Breach of contract disputes are some of the most common disputes between both individuals and businesses. Our Chicago litigation lawyers are committed to simplifying the burdens of business disputes, lawsuits, including the burdens of prosecuting and defending breach of contract disputes, so that our clients can focus on protecting their personal and professional interests. As no two breach of contract cases are exactly the same, the mission of our law firm is to provide individualized attention to the circumstances and needs of each client. Ordinarily, a party (whether it be a business, executive, entrepreneur or an individual) must perform pursuant to his or her business agreement unless both parties to the business agreement consent to a change in contractual terms. Any deviation from the specific terms of the business agreement could be deemed a contractual breach. The breaching party is often liable for damages incurred by the non-breaching party. 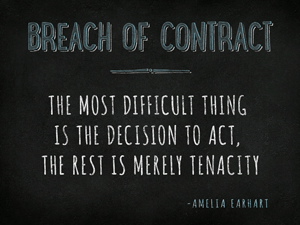 A breach of contract could occur in regards to a written contract or an oral contract. Intentional interference with contract (intentionally damaging contractual relations of another) is a related breach of contact claim. Several situations may give rise to a breach of contract claim. For example, a party to the business agreement may do something that violates a term of that business agreement; a party may refuse to perform its obligations under the contract (such as delivering product or making payment); or a party may act (or fail to act) such that it makes it impossible for the other party to perform under the terms of the contract. Economic damages suffered by the non-breaching party as a result of the breach party’s business contract interference. Most often, the fundamental issue in a contract dispute is determining the intent of the parties. The intent of the parties sets out the parties’ expectations to the business agreement, the extent of the parties’ duties and obligations, how the parties have allocated the risks of the transaction, and what the consequences of the breach of contract will be. Learning the true intent of the parties, as understood by the parties involved, is generally reflected by the four corners of the business agreement. Thus, it’s crucially important to always have a well written business agreement in place that properly reflects the business transaction and the parties’ duties and responsibilities. A breach of contract dispute generally arises when a party fails to perform under the terms of the contract. This failure to perform can cause the non-breaching party significant damages and remedies may include enforcing the contract on its terms, canceling the contract and suing for repayment of money expended, or suing for compensatory, consequential or liquidated damages. Every breach of contract case is different, just as every business and individual client is different. An important consideration in any contract dispute is to determine the ultimate goals of the client. For example, is the goal to attempt to reach a settlement? Is the goal to be most cost efficient? If the client is the plaintiff, is the goal to attempt to obtain the highest damages possible against the breach of contract defendant? Our Chicago breach of contract attorneys will consult with you, discuss the facts of the dispute and other circumstances, listen to your goals, and attempt to answer any questions you might have regarding your contract dispute. Through this consultation, we will attempt to determine the most efficient and cost-effective way meet your personal, business and legal goals. Our Chicago law firm handles cases in state and federal courts throughout Illinois, including Cook, DuPage, Kane and Will Counties. For additional information about our breach of contract lawyers and to discuss your breach of contract case, please contact our Chicago law office at 312-789-5676. You can also contact us by email or by providing your information in the sidebar to inquire about your potential breach of contract matter.